March Madness provides plenty of time for afternoon blogging! Do you have recipes that you make once and then forget all about? And then a few years later you recognize that you have all of the ingredients and can’t figure out why you’ve waited so long to make said recipe again? Somehow I ended up with two unopened bags of Reese’s peanut butter chips and immediately Peanut Butter and Jelly Bars came to mind. I hunted down the recipe which was saved on my computer. Although I haven’t made these in years, I knew exactly where it was. These bars are really easy but taste WAY more elegant. The dough requires that you blend cold butter into the flour mixture. I recently saw on a blog that this can be done in the food processor. So I gave it a try and it worked magically! Within a few seconds, my butter was blended perfectly. Transfer the flour mixture into a bowl and stir in one egg to form your dough. Place half of the dough on the bottom of a greased pan. Then layer with jelly, peanut butter chips, and more dough. The dough bakes up puffy and soft with warm oozing jelly! You definitely need to let these cool before digging in. But not completely if you are looking forward to the warm peanut butter chips and dripping jelly. These bars are a true crowd pleaser! Who doesn’t love the combination of peanut butter and jelly? I’ll tell you this…the BOY can’t keep his hands off them!!! My favorite way to store AND eat these bars is straight from the freezer. When they are chilled, the peanut butter chips are crisp and the jelly still juicy! My mouth is watering just thinking about these bars waiting for me in the freezer! I warned you that I had another recipe to share! When I was reading through blogs this week, I found this cookie bar recipe on Fearless Homemaker. Since I had a fraction of a bag of mini M&M’s hanging in the pantry, I knew I had to make these too! Since I didn’t have a full bag of candies, I used some chocolate chips as well. One can never have too much chocolate in cookie bars! Typically M&M’s are safe in our house because I’m just not a huge fan, but these M&M Cookie Bars are so soft, chewy, and delightful, they were not safe at all! If you’re looking for something fun to make for an upcoming holiday, use the bright Easter colored candies! The pastels will brighten up these cool spring days! Preheat oven to 375 degrees. Grease a 9-inch square baking pan. Set aside. Stir together flour, sugar, and baking powder. Cut in butter with pastry blender or fork until mixture resembles course crumbs. Stir in beaten egg until blended. Reserve half of the mixture and press the remaining mixture into the bottom of the prepared pan. Stir jelly slightly; spread evenly over the crust. Sprinkle 1 cup of peanut butter chips over the jelly. Stir the remaining peanut butter chips (around 2/3 cup) into the reserved crumb mixture. Sprinkle it evenly over the top of the peanut butter chips. Bake for 25-30 min or until lightly browned. Cool completely on a wire rack. Cut into bars. Note: These taste incredible frozen straight from the freezer! Preheat the oven to 325 degrees. Adjust the oven rack to lower-middle position.Grease an 8×8 inch pan and set aside. In a medium sized bowl, whisk together the flour, salt, and baking soda; set aside. In a large bowl, beat the butter + sugars until light and fluffy. Add the egg and vanilla and mix well. Using a rubber spatula, fold the dry ingredients into the egg mixture until just combined; do not overmix. 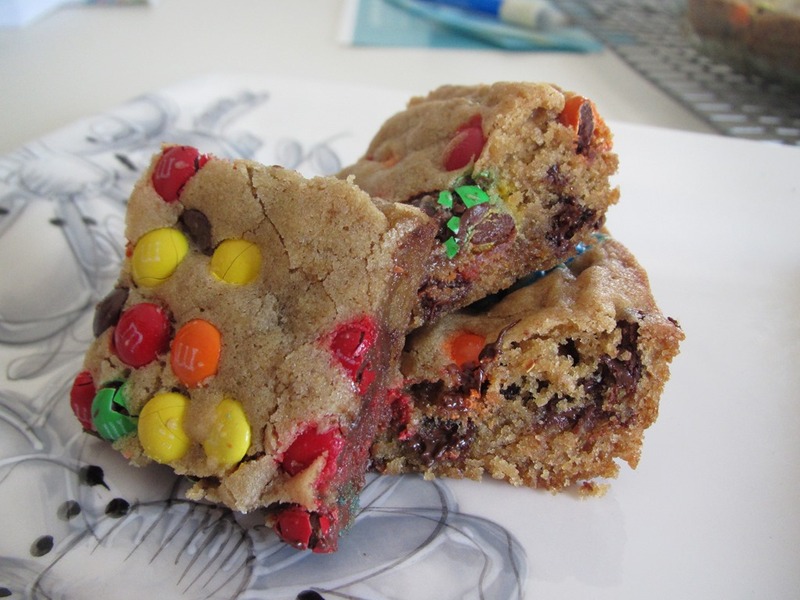 Fold in 1/4 cup of mini M&M’s and 1/2 cup of chocolate chips (or 1/2 cup of M&M’s). Turn the batter into the prepared pan, smoothing the top with the spatula. Sprinkle the remaining M&M’s on top and press in slightly. Bake 25-30 minutes, until the top of the bars is light golden brown, slightly firm to the touch, and edges start pulling away from sides of pan. Cool completely before cutting. Okay, these are just ridiculous. You had me at peanut butter chips. I think I gained 10 pounds just reading these recipes 🙂 I love to bake, but I hate having all the sweets in the house. Maybe I’ll try these out for Easter. I bet they’d be a hit! They have a way of disappearing quickly! The best thing about these is that you can stash them in the freezer and take a bite when you want avoiding the 10 pound weight gain they want to give you…he he! Ah, I wish freezing sweets worked for me 🙂 You have some willpower! 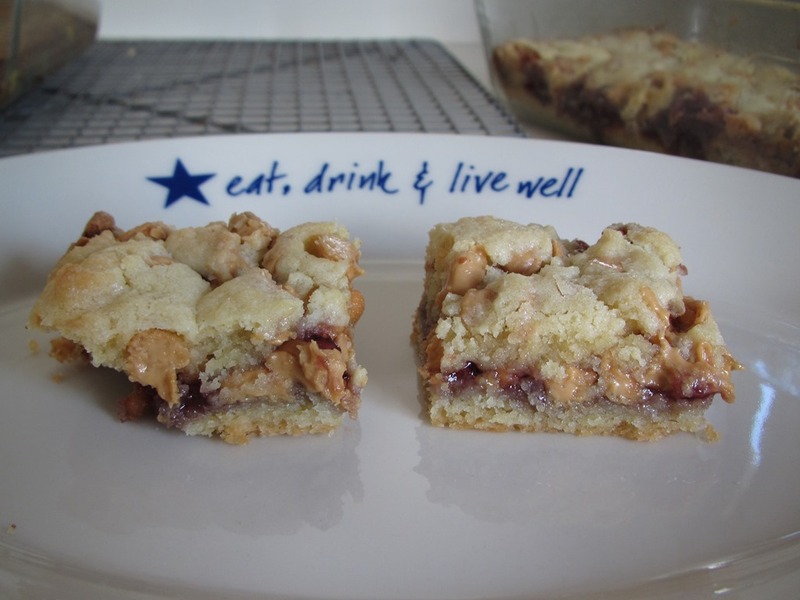 These look like the most incredible PB&J bars I have ever seen! I love all of that PB&J oozing out! I know! I wanted to make sure I captured a photo of that because it really is the BEST part. Thanks for the comment! Oooh, those pbj bars look crazy good! They would be so perfect warm with everything oozing! I have so many recipes I want to make again, but a lot of times I can’t find the time. That’s the hardest thing about being a baker…there are never enough hours in the day!! !